We continued to zig-zag our way up through Malaysia today, leaving the chilly mountain air of the Cameron Highlands to descend through cloud and swirling mist. Water was dripping off the palm trees in the valley below, where we lined up for a closed-road hillclimb, our first tarmac test. Our hotel, The Copthorne, stood at the summit at 5,300ft, our plan was to tackle a back-road that had been promised we could safely enjoy all to ourselves. It was to be the first disappointment of the day. Police performed a great job in closing down local traffic, but John Spiller’s team had doubts about local farm workers, who would pop out of tiny side-entrances from fields on motor-bikes… so discretion won, and the test was cancelled in the interests of safety. Instead, we all drove it at our own pace, and then turned to return to the valley below. 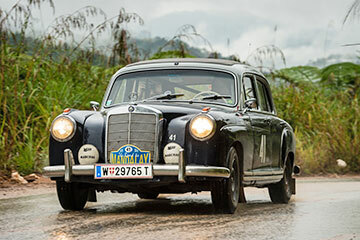 Our day took us across the width of Malaysia to the east-coast again, and the route was to test the mettle of the navigators as there were last-minute re-routes to cope with. We had to cross a large river. Early in the event planning, there were ideas of taking a local flat barge that carries a few cars across by locals hauling on a rope, Indiana Jones-style. This idea was soon discarded. But recent monsoons had flooded much of this part of Malaysia and with roads opening and closing at a short notice to cope with repair teams, planning a route much in advance was looking more and more unlikely to provide a reliable solution. So John left it until today to finally set the course, with the E.R.A. team meeting crews at road junctions and the café controls to hand out re-route information and amendments. It was a stressful day for both organisers and crews, who drove through villages and small towns that showed plenty of evidence of the horrendous damage torrents of water can cause when rivers fail to cope with flash-floods. The Mercedes Team of the Pohls had running problems of their own, one Mercedes driven by Andreas Pohl requiring a push start having lost all but third gear, and later seen needing attention in a road-side exhaust centre. The VW Karman Ghia of Patrick and Christine Sommer had the surprise of being met at the end of the day by over 20 Volkswagens all lined up in the street opposite our hotel, local enthusiasts having come far and wide to meet the German crew and the Beetle from America, the hard-driving Staples. 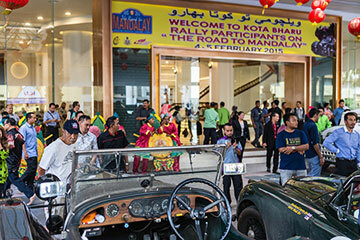 Local bands and dancers boomed through the marble halls of Grand River View hotel and feted the arrival of HRH Idris Shah, our Malaysian Sultan who had another enjoyable day at the wheel of his ex-Paul Carter XK Jaguar, the crew taking advantage of the offer of parking in the pride of place slot opposite the main doors of the hotel while the rest of us had to find parking underground. Rod Wade was running well today after yesterday’s drama of sliding off the road into a ditch, bashing the front left corner badly of his Ford Crestline. As Rod carried a spare radiator it was merely a case of watching Andy Inskip and Tony Jones take a sledge-hammer to his bodywork, changing a wheel, sorting bent steering and fitting the new radiator. Today’s route had taken us from the chilly mountain air of Malaysia’s hills lined with bright green bushes of tea plantations, to clipping along busy roads in bright sunshine with temperatures hovering just over 30-degrees centigrade. Tomorrow we cross Malaysia to the west side again, where our route includes a cork-screw climb up the side of a mountain. The climb is called the Tour de France, as it’s used by local cycle racers, the plan is to drive it as a tarmac test-section before we all end up in Georgetown, where the rally is based for two nights, Friday being a welcome day off.